When you upgrade to Client Appointment Manager version 7.0, you’ll receive all the features introduced in previous versions of Client Appointment Manager, too! See the list of new features from each previous version. We've added five more custom fields to both the appointment and client forms. Track even more appointment and client information with these additional fields. Give your clients a monthly calendar showing their upcoming appointments. Help reduce no-shows by handing your clients an easy-to-read calendar so they don't miss another appointment. Do you have a front office person who only needs to schedule appointments? The new “Limited” user type allows you to create users who can only schedule or edit appointments and clients. Limited users can also access all reports. If you schedule appointments in 5- or 20-minute increments, we've added two new appointment time intervals so you can schedule your clients even faster and easier. Just click the Refresh button and instantly synch client records that have been added or changed in Client Appointment Manager or QuickBooks. You can now attach documents or images to client records. With a click of your mouse, you can access reports, contracts, agreements, blueprints, surveys or any other client-related file or image. File types supported are .pdf, .doc, .docx, .xls, .xlsx, .rtf, .bmp, .jpg and .gif. Be sure to keep your appointment software up and running. New version 5.0 is the ONLY version of Client Appointment Manager and Client Appointment Manager Pro guaranteed to work with Windows 7. You can now select more than one employee with the find open time tool, instead of only one or all employees. By limiting the employees you wish to search, you can find open appointment times more quickly and service your client faster. We've added the day of the week to appointment reports so it's easier to see when a client has had an appointment or when a client has an appointment scheduled. Now you can mark your appointments as "Checked-In" or "Completed." These new statuses are available in all appointment reports and are used by the new Check-In Assistant in Client Appointment Manager Pro (see below for more information). Who's in your waiting room? When did they check in? How long have they been waiting and who are they here to see? Who's late for their appointment? The new Check-In Assistant found only in Client Appointment Manager Pro instantly shows you and automatically updates in real time. Use this tool to check-in client for their appointments and mark client as completed when they're no longer in your waiting room. Instead of importing all of your clients from QuickBooks, you can choose to skip inactive clients. Whether you have hundreds, or even thousands of clients, client lists load faster making it easier to find clients and schedule appointments. Insert custom fields into your letters to create tailored marketing messages and improve client communications. Easily track changes made to appointments by individual users. See who scheduled or deleted an appointment, made changes to appointment times, descriptions, services, and more. 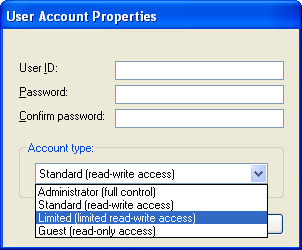 Only users granted administrator rights within Client Appointment Manager Pro can view this information. See how many new clients each of your employees, or all employees, have acquired for any time frame. Ideal for sales contests and measuring marketing efforts. Client photos are just a click away! Now you can quickly and easily verify clients upon check-in. Reduce your liability and make sure you're providing the right service for the right client. Build a custom online appointment form for your business. The appointment form can include your company logo, banner, color scheme, and appointment days and times. Use your appointment form's web address on business cards, advertisements and brochures, or link to the form from your web site. All online appointment requests appear instantly in Client Appointment Manager Pro. You can also access appointment requests from any Internet browser and send appointment requests to your e-mail address. Improve communication and efficiency when you e-mail appointment information to employees for access via any web browser or PDA. With just a few clicks, your employees can receive up-to-date appointment information when visiting a client site, at home or anywhere. Seamlessly share client information between Client Appointment Manager and QuickBooks. When you add client information in Client Appointment Manager, it gets added to QuickBooks (and vice versa). Launch a QuickBooks invoice right from Client Appointment Manager to save time. You won't forget to squeeze a client in an available opening with the improved waiting list. With just one click, Client Appointment Manager 3.0 does all the work for you. Each time you launch the waiting list you'll instantly see what appointment requests can be scheduled. All the information needed to confirm the appointment with the client is at your fingertips. With new date and time ranges, you can accommodate more requests and book more business. The on-screen waiting list reminds you to take action on expired appointment requests or appointment requests due today or due tomorrow. Ensure you book enough time for your clients with service templates. Assign a duration and color scheme to each of your services and Client Appointment Manger 3.0 will automatically adjust the appointment length and color scheme to match the template. If you book more than one service for an appointment, version 3.0 will combine the durations for you. Schedule repeating appointments with ultimate flexibility. Use Client Appointment Manager's custom date selection calendar or apply scheduling patterns such as daily, weekly, or the first Monday of every month. Also, version 3.0 will display details of appointments conflicting with the repeat appointment you are scheduling so you can take the appropriate action. Double bookings can waste time and frustrate clients. Turn on the warning for double bookings and Client Appointment Manager 3.0 will tell you when there is a conflict when you schedule or move an appointment. If your business double books appointments, simply turn the warning feature off. Keep your client information safe with unique logins. Users can create their own username and password and administrators can grant read-only or read-write access for each user. Each unique user's preferences, such as background color and view options, will be saved to his/her profile. You can customize your view options in many ways. In version 3.0 you can add custom fields or display the time intervals on the scheduling worksheet, sort the client window by any field in the client form, view 1 or 2 months of the on-screen calendar and more! Four appointment status types have been added to Client Appointment Manager 3.0. New appointments default to the "scheduled" status but can be marked confirmed, canceled or no-show. Unique icons in the upper right hand corner of the appointment let you know at-a-glance the appointment status. Canceled appointments will change the text and background color so you can keep client information but quickly see you have an opening.